We've long been enjoined not to judge a book by its cover, but what about its spine? Years ago, when I worked as a books clerk at the old Yale Co-Op bookstore, featured books were always turned "face out" to show the front cover to advantage. And yet, even when denied the privilege of showing their fronts, books -- physical ones, at any rate -- have always had a secret weapon: their spines. And, when a book is purchased, brought home, and read, I'd venture to say that very few of us, especially those whose shelves are already full to bursting, have the luxury to place any of our cherished volumes face out -- and thus, it's usually by their spines that we know them. I got to thinking of this after Penguin Books sent me an image of the spine for the US edition of PYG. I love the dramatic background of scarlet, over which my name and the title are further framed by lovely golden side-squggles. It's the kind of thing that, or so I hope, will tempt those who still love to browse in person to lift the book from the shelf to see what more it has in store. And, with my thoughts thus turned in a lateral direction, I go to thinking about spines, and how seldom most of us ponder the creative space, narrow though it sometimes be, of their invitation. The best of them seem to say "pull me out!" "read me!" -- though at times, if they are wider than usual, they may loom more ominously, daring us to find the time to peruse their many pages. In the early nineteenth century, books were often sold without bound covers, with the assumption that their owners, reasonably well-heeled, would have them bound to their own library's design, which meant row after row of matching leather spines. I've seen one such collection, in a room hidden deep within the Mitchell Library in Glasgow, where an enormous private library, ranging in size from duodecimo to double-elephant Imperial Folio, still resides inside its original leather cases, and original cabinets as well (this room was also the site of Shauna McMullen's recent "blue spine" installation). 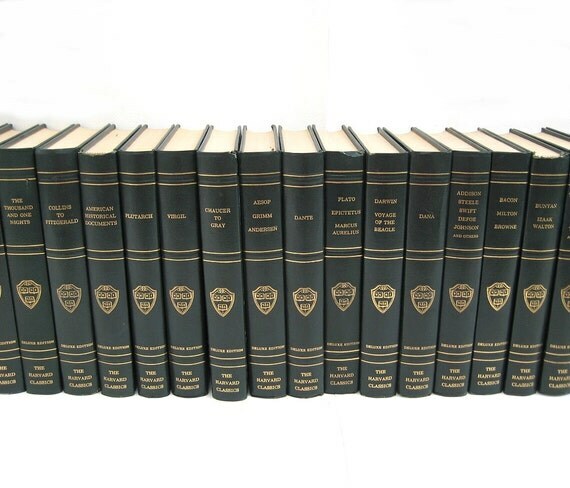 Yet for most of us, this is a sight we'll seldom see, unless we're especially fond of bound sets, such as the Library of America or the Harvard Classics. No, our shelves are mostly a motley of colors, with white and green and crimson and brown bands of color jostling for our attention. I've picked out a few of my favorites from my own collection, and put them in a Flickr album, and I'd invite any others who, along the edges of their shelves, have a few which somehow leap into mind, or into hand, to do the same. After all, in the long time that often passes between first and next readings, it's often the only way we see our old friends, their faces hidden and pressed to each others' rear covers -- by that band of identity which, figuratively and literally, binds them all together.